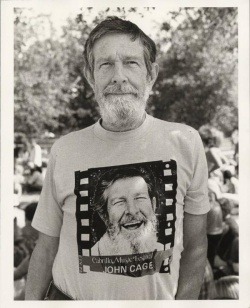 John Cage at the Cabrillo Music Festival, 1977, photographed by Betty Freeman. John Milton Cage, Jr. (1912–1992) was an American composer, music theorist, writer, and artist. A pioneer of indeterminacy in music, electroacoustic music, and non-standard use of musical instruments, Cage was one of the leading figures of the post-war avant-garde. Silence: Lectures and Writings, Wesleyan University Press, 1961, 276 pp, Log, ARG, IA; 50th anniv.ed., Wesleyan, 2011, PDF. Diary: How to Improve the World (You Will Only Make Matters Worse), New York: Something Else Press, 1962, 14 pp; Part 3, New York: Something Else Press, 1967; new ed., eds. Joe Biel and Richard Kraft, Los Angeles: Siglio, 2015, 173 pp. Pt. 1 originally appeared in Joglars 3; pt. 2 in the Spring 1967 issue of Paris Review. A Year from Monday: New Lectures and Writings, Wesleyan University Press, 1969, Log, ARG, OL. Notations, New York: Something Else Press, 1969, Log, ARG. Song Books (Solos for Voice 3-92), 3 vols., New York: Henmar Press, 1970, Log. M: Writings ’67-’72, Wesleyan University Press, 1973, 217 pp, Log, ARG. Empty Words: Writings ’73-’78, Wesleyan University Press, 1979, 187 pp, Log, ARG. X: Writings ’78-’82, Wesleyan University Press, 1983, 187 pp, Log, ARG. Anarchy. New York City - January 1988, Wesleyan University Press, 2001, 81 pp, PDF. At A John Cage Compendium. Scores and Prints, New York: Whitney Museum of American Art, 1982, 6 pp, IA. Robin White, "John Cage", View 1:1, Oakland, CA: Crown Point, 1978, 16 pp. Richard Kostelanetz, Conversing with Cage, Routledge, 1987; 2nd ed., 2003, Log. Richard Kostelanetz, "His Own Music: Ur-Conversation with John Cage", Perspectives of New Music 25:1/2 (Winter-Summer 1987), pp 88-106, & 26:1 (Winter 1988), pp 26-49, ARG/1, ARG/2. with Joan Retallack, Musicage: Cage Muses on Words, Art, Music, Wesleyan University Press, 1996, Log, ARG. Peter Dickinson (ed. ), CageTalk: Dialogues with and about John Cage, University of Rochester Press, 2006, Log, ARG. The Selected Letters of John Cage, ed. Laura Kuhn, Wesleyan University Press, 2016, 674 pp, ARG. Review: Pearlman (Leonardo). John Cage: From Zero, dir. Andrew Culver and Frank Scheffer, 85 min, 1995, YouTube. In The Ocean, dir. Frank Scheffer, 54 min, 2001, YouTube. Michael Nyman, Experimental Music: Cage and Beyond, New York: Schirmer Books, 1974, 154 pp; 2nd ed., foreword Brian Eno, Cambridge University Press, 1999, 196 pp, Log. James Pritchett, The Music of John Cage, Cambridge University Press, 1993, 223 pp, Introduction. Reviews: Haskins (1996), Bernstein (1996), Brooks (1997). William Fetterman, John Cage's Theatre Pieces: Notations and Performances, Harwood Academic, 1996; Routledge, 2010, PDF. David W. Bernstein, Christopher Hatch (eds. ), Writings through John Cage's Music, Poetry, and Art, University of Chicago Press, 2001, 310 pp, PDF. David W. Patterson (ed. ), John Cage: Music, Philosophy, and Intention, 1933-1950, Routledge, 2002. Kyle Gann, No Such Thing as Silence: John Cage's 4'33", Yale University Press, 2010, 272 pp, PDF. Reviews: Joseph (2010), Revill (2010), Saval (2010), Richardson (2010), Berret (2010), Lefresne (2011), Weagel (2011), Hirst (2011). William Anastasi, The Cage Dialogues: A Memoir, ed. Aaron Levy, Philadelphia: Slought Books, 2011, 120 pp, PDF. Peter Jaeger, John Cage and Buddhist Ecopoetics: John Cage and the Performance of Nature, Bloomsbury, 2013, EPUB. David Grubbs, Records Ruin the Landscape: John Cage, the Sixties, and Sound Recording, Duke University Press, 2014, 248 pp, ARG. David Revill, The Roaring Silence: John Cage, a Life, New York: Arcade, 1992, 375 pp; 2nd ed., rev., Skyhorse, 2014, 384 pp. Reviews: Driver (1993), Brooks (1997). David Nicholls, John Cage, University of Illinois Press, 2007, 144 pp. Review: Perry (2008). Kenneth Silverman, Begin Again: A Biography of John Cage, New York: Alfred A. Knopf, 2010, EPUB. Rob Haskins, John Cage, London: Reaktion Books, 2012, 180 pp, ARG. Reviews: Delaere (2013), Sealey (2013), Shultis (2014). Kay Larson, Where the Heart Beats: John Cage, Zen Buddhism, and the Inner Life of Artists, Penguin, 2012, 474 pp. Review: Ratliff (2012). At A John Cage Compendium, eds. Paul van Emmerik with Herbert Henck and András Wilheim: A-C, D-J, K-P, Q-Z. A John Cage Compendium, ed. Paul van Emmerik, with Herbert Henck and András Wilheim. Contains a chronology of Cage’s life; catalogues of music, text, and art by Cage; a bibliography; and lists of sources, recordings and films. Making the Right Choices: A John Cage Celebration, curated by the New World Symphony. This page was last modified on 7 February 2019, at 18:16.